*** THE INTERNATIONAL BESTSELLER AND REESE WITHERSPOON BOOKCLUB 2018 PICK! ***The perfect couple. The perfect crime? `Deftly paced, elegantly chilly thriller... Steadman brings similar qualities of wit, timing and intelligence to this novel... a proper page-turner' New York Times Erin is a documentary filmmaker on the brink of a professional breakthrough; Mark a handsome investment banker with a bright future. They seem to have it all. But do they? On a dream honeymoon to the tropical island of Bora Bora, Mark takes Erin scuba diving. Everything is perfect. Until they find something in the water. Something that will change their lives forever. Erin and Mark decide to keep their discovery a secret. Set to be the blockbuster read of the summer, this is an unmissable, fast-paced, jaw-dropping thriller from a debut writer destined for great things. `A wild, page-turning ride! It's the perfect beach read!' Reese Witherspoon (Reese's Book Club x Hello Sunshine book pick) `Worthy of Hitchcock' Sunday Times `Pure adrenaline: I swallowed this book whole' Erin Kelly, author of He Said, She Said `A thriller for our times' Louise Candlish, author of Our House `A stunning debut. 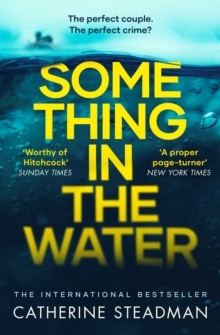 Something in the Water is psychological suspense at its absolute finest, and Steadman has all the makings of a writer poised to shoot straight to the top of the genre' Book Spy `I loved this. Drawing you in from the very first sentence ... and becomes a nice twist on the typical psychological thriller' Book Tribe `If you like thrillers with a huge twist and great plot this is for you' Fiction Obsession `Catherine Steadman's enthralling voice shines throughout this spellbinding debut novel' Dwell in Possibility 'A taut, relentless read.